Following a long radio silence, Finnish rock giants H.I.M. have announced the Bang & Whimper Tour 2017, closing the final chapter on their 26-year career. 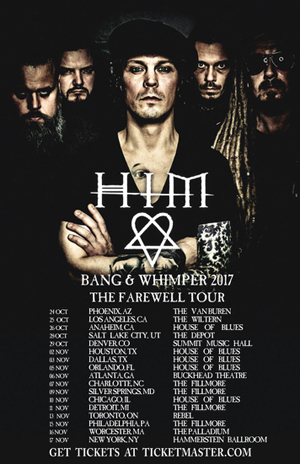 Front man Ville Valo offers, “After a quarter of a century of Love and Metal intertwined we sincerely feel H.I.M. has run its unnatural course and adieus must be said in order to make way for sights, scents and sounds yet unexplored. We completed the pattern, solved the puzzle and turned the key. Thank you." Formed in 1991 by vocalist Ville Valo, guitarist Mikko “Linde” Lindström and bassist Mikko "Migé" Paananen, H.I.M. truly stand out as one of the rock world’s most unique acts. Beautifully blending metal, goth and hard rock with deep, thoughtful and moving lyrics, H.I.M. offered the world a new take on the metal genre, which became known as Love Metal (also the title of their fourth album). Over the course of eight studio albums, H.I.M. captured the hearts and minds of fans across the globe, drawn by their irresistible and inimitable style. Under the banner of their Heartagram logo – a potent symbol encapsulating the juxtaposition of the light and dark, the fierce and forlorn, and the evil and love found in their music - H.I.M. filled venues and crashed charts the world over, collecting numerous awards, gracing countless magazine covers and becoming the first Finnish act to achieve Gold status in the USA. Now, four years after the release of their last studio album Tears On Tape, H.I.M. are saying farewell, taking in 14 countries across 35 shows for their final goodbye. Bassist Mige shares, "At the end of 2017 we will be released into the wild. Before this event of great transformation, we would love to offer you one last chance to experience our live performances in His Majesty's service. It shall not be a weepfest, but a celebration of love metal in all its lovecraftian glory! See you there!" H.I.M. is Ville Valo (vocals), Mige (bass), Linde (guitar), Burton (keyboards), and Kosmo (drums).